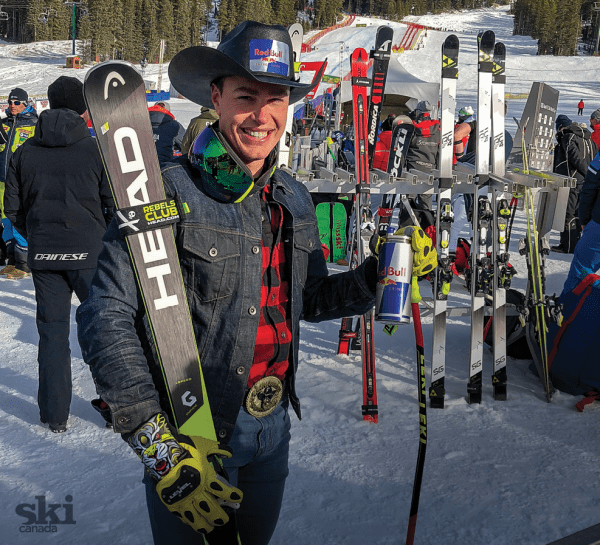 The next few days in Lake Louise included a whirlwind of tributes and that infamous Canadian Cowboy farewell super-G run dressed in jeans, bearing the Canadian flag to the finish area where he threw on a cowboy hat as the crowd cheered. Ski Canada caught up with him a few weeks later at his home hill of Tremblant, during the 24h charity event for which Guay has been a long-time ambassador. SKI CANADA: Welcome home, Erik. Tell us about your involvement in Tremblant’s 24h event. ERIK GUAY: It’s great to be home. I feel more relaxed and I can enjoy the event more. It’s one of those charity events that pulls at everybody’s heartstrings. As a parent you can imagine what the families of these sick kids go through. That’s why it’s important for me and why it has become such a success. SC: “Country, Community and Family” has been your motto. What does it mean to you and how will the order change? EG: Yes, that’s always been my motto; what I strive for. I’ve spent a lot of time representing the red and white flag, travelling and trying to instil Canadian values everywhere I go. But I think it’s time now to spend more time with family, in my community, and see how I can make a change locally. SC: Your leadership and impact have reached far beyond the ski industry. You are the modern Jean Béliveau…you deserve that hero’s welcome. EG: Thank you, he certainly was an incredible ambassador and I actually looked up to him quite a bit. There are just too many people to thank, but it’s great to come back to your hometown and feel that recognition. I plan to give back and share my knowledge as best I can. SC: How would you define success in your own words? EG: Success is “how you can change the lives of others.” It’s not so much how many podiums I bring back or how many times I won the World Championships. If I can inspire kids to live healthier lives, I think that’s worth more than the number of medals; to inspire them to stay in sports, to lead active lives, to have proper nutrition. As a society, I think we have started to overlook sport and how valuable it is. SC: You’ve been racing at crazy speeds all over the world for more than 17 years. It would have been normal for you to let loose, but we couldn’t find any gossip or scandals at all! Were you raised in a strict environment? EG: Ha, I’m glad there were no scandals or that you just haven’t found the skeletons (laughs). My dad wanted my brothers and me not to make excuses and work hard. Those were the values he taught. We got along really well. And later I had a great coach on the national team, Burkhard Schaffer, who was the same way. As long as I showed up prepared and on time, there were never any issues. SC: What was your most cherished moment or biggest accomplishment in your racing career? EG: If I had to choose one, I’d say it was when I won two medals at the World Championships in St. Moritz; that was quite special. There have been numerous great moments along the way, like winning in Garmisch and Lake Louise many years ago. 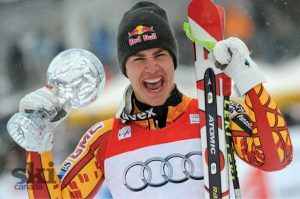 Winning the Overall Super-G Crystal Globe, too. SC: What do you think you will miss the most about the White Circus? EG: My fellow competitors, first of all. I’ve made amazing friends on the world circuit. I will also miss that feeling of adrenaline in the starting gate, when you know you’re competitive, about to charge and have a chance to be on the podium. SC: Your parents Ellen and Conrad, brothers Kristian and Stefan and you are all accomplished skiers, so the Guay name is well-known around Tremblant. Any insights on how so many great skiers come from here? EG: You don’t need a big hill to produce champions. Fundamentally you need great coaches that are passionate to get kids excited. We have the advantage of good hard snow. That’s why we produce great technical skiers because we have to learn to ski on that challenging surface. I’m working on my daughters for the next generation; might take a few years! SC: Did your wife know what she was getting into with the roller coaster of your ski racing career? EG: I first met Karen in Lake Louise; she was there randomly with her family. She happened to be standing next to my mother, who mentioned that her son was racing, so we met briefly. I later hurt my back so was rehabbing in Calgary and she came to visit. She’s really been amazing and a great partner. It has not been easy for her, especially when I was away so much. SC: You have four young daughters now, what are their names in the right order? EG: Logann, Leni, Marlo and Maude. So Ls and Ms. But I still mix up their names all the time, especially when I’m mad and trying to yell. It’s so frustrating (laughs). The eldest is already in the ski racing club. SC: Even the younger ones seem gifted in dance classes, too. If Dancing with the Stars came calling, would you say yes (for dad street cred)? EG: Only if I didn’t have to move too much. SC: Can you share a tip from your sports psychology training on how to be more relaxed and less stressed in competition? EG: One tip that I can give is that it’s important to stay present and breathe. It’s easy to imagine yourself standing on the podium, but it’s important for young athletes to learn to manage expectations and pressure. Sports psychology is the next big realm. Skiing has focused on physical fitness, but the mental aspect is something we have to explore and learn from. I try to wake up with a positive attitude. SC: When you suffer a season-ending injury, though, it must be hard to stay positive for six months and come back stronger. You guys all seem so close on the team. Do you become like a band of brothers? EG: We all go through many highs and lows and spend so much time on the road together that you feel like family. When I watched Manny get hurt [at Lake Louise in November] I imagined myself in his position and, honestly, I didn’t think I’d have the mental energy to rehab again and do what it takes to come back. That’s when I knew. SC: Marco Büchel (ex-ski racer now TV commentator in Europe) also gave you some advice. EG: Yes, during inspection in Val Gardena, I asked him how he knew when it was time to retire. He said he felt it from one day to the next; he knew before a race that it was over because he wasn’t into it anymore. I felt the same way the moment Manny crashed. SC: Would you agree that downhill ski racing is an extreme sport? EG: Yes, definitely. There is no other sport like it. When you think of hockey or motocross racing, for example, you’ll see knee injuries but athletes are back in four to six weeks. Nothing like the crashes we see at high speed in ski racing that can end your season or career. SC: Probably a loaded question, but how can we improve ski racing safety? EG: I have my own thoughts on that. Safety is a broad spectrum. We have seen advancements in helmets and suit technology, but if you look at the era of the Crazy Canucks back in the ’70s and ’80s, we see a big difference, mainly with course preparation. It used to be bootpack, a lot rougher with more terrain that made the speeds a lot slower. So instead of crashing at 140 kph, they were going about 80-90 kph, so maybe if they could bring back the rough pack, because now they use better grooming material that makes it super smooth and so much faster, but we accelerate so much more out of the turns which can end up being more traumatic if we fall. On the other hand, if you start taking away jumps and reducing the speed, then it’s not downhill anymore. The skis were always fast even with the change in radius. Netting technology has improved and I’m sure it will continue to evolve. It’s important to have a discussion about safety to protect the athletes; to not just criticize but to offer solutions. SC: Any opportunities you’re considering? EG: I don’t want to jump on the first opportunities. I’d prefer to take my time and weigh my pros and cons. I kind of feel like a CEO who’s moving on, where you’re kind of relevant for a number of days, so I want to take advantage of that. First I want to enjoy some time at home but I also need to keep busy, so I’ll be excited to put my energy into something new. SC: Any plans for the Athlete Farm, the training gym you built? EG: I can just do upper body now and get huge (laughs). I still want to stay in shape; sometimes we see athletes slow down after and put on weight, so we’ll have to do this interview again in two years. SC: What song would you like us to play when you get inducted into the Canadian Ski Hall of Fame? EG: I don’t know (smiling). Most of the stuff I listen to is to pump me up before the races, so I’m not sure that would be very fitting for the Hall of Fame. SC: Do you think you’ll need some help to transition to “civilian life”? EG: My support group is my family. I did talk to other athletes and they warned me about the change of pace from having these big goals to achieve at high speed. I think it would take a lot of stress off athletes if they kind of knew what to expect or what to do next. SC: You’ll still be a great ambassador for sponsors and causes. You also have a new partnership with Club Med in Les Arcs, France. Are you finally going to take your family on a trip somewhere? Or does Karen dream of a beach vacation in the middle of winter, at last? EG: We’ve never done that because I was always thinking someone is out there training harder. I think we’ll plan to go somewhere hot—in the spring. SC: We sure wish you that and hope you enjoy time with your family now. Congratulations on an amazing ski career. EG: There’s a life after sport. The most important thing is health. If we have that, everything else comes a distant second. So, of course, I love my sport, but I am happy I walked away when I did, and now I can be healthy and happy with my kids. by MARIE-PIERE BELISLE-KENNEDY in Winter 2019 issue.